Roger Q. is an endearing ten year old young man who is being seen once a week at the San Jose Scottish Rite Language Disorders Clinic. Roger’s parents heard of the services offered by the clinic from a teacher at a local school. Both Roger and his sister have benefitted from speech and language services. His sister was seen at this clinic several years ago, so his mother was already familiar with the process of receiving speech and language treatment. Roger has both an expressive and receptive language disorder. Language has been hard for Roger for some time now, as his mother first noticed the problem when he was four years old. Roger has had difficulty at school in the areas of reading, writing and spelling. His language disorder, as well as other learning issues like mild indicators of dyslexia, has made school a challenge for Roger. Roger has had difficulties with many areas of expressive and receptive language. Therapy has targeted many different areas such as concepts, directions, word structures and tenses, sentence formulations, word classes, vocabulary, grammar, definitions, outlining information, pronouns and answering questions from paragraphs. Roger has a difficult time verbally expressing himself, as well as writing and creating sentences and understanding what is told to him. Roger’s mother stated, “My child would speak in very short sentences and was expressing frustration when trying to speak. He was reading below class level.” After treatment began, his mother stated, “Roger is doing much better expressing himself. It seems to be getting easier for him to put his thoughts into words. His vocabulary has improved and reading comprehension is much better. He is getting better grades at school.” By participating in treatment his mother has learned ways to help Roger and they practice extra work at home to reinforce what is done during his treatment sessions. Roger’s mother stated she would definitely tell other parents about the services here. Roger attends a private school, so therapy at this clinic has been the only source of treatment for his language disorder. Roger is currently in the fourth grade, a very challenging year, in which the curriculum becomes increasingly difficult. His parents continue to notice improvements in his academic and speech and language skills. 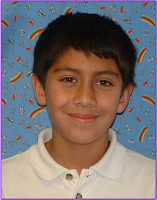 Roger is making good grades and is excelling in soccer, where he has joined a competitive league. He also likes to spend his spare time playing video games.